You choose your list of currencies and the application gives you automatically converted amounts. 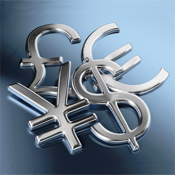 You build your portfolio by specifying the monetary amount held in each currency. The application automatically gives you the total amount of your portfolio in your currency. You can view a graph of distribution of amounts held in each currency. List of the 134 currencies with managed exchange rate display. Ability to search a currency not its wording, ISO code, or country name. List of 165 countries managed with the currency used in each country. Ability to search the country by its wording or its currency. Displaying the country and exchange rate on a map.